The ASUM / ACIPC Guidelines for Reprocessing Ultrasound Transducers released in 2017 written by ultrasound clinicians, infection prevention and control experts and microbiologists, has had international impact and opened up discussion on best practices. Whilst we are excited to raise awareness and debate on this important issue, we acknowledge the requirement for more research into this area to assist with revision of the next set of Guidelines. 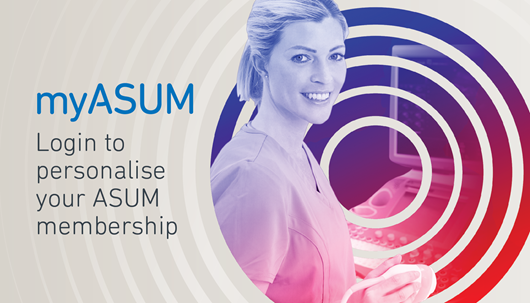 ASUM’s resident team member, Dr Jocelyne Basseal, who manages the journal AJUM, along with Research Grants and Standards of Practice has an academic and research background in Microbiology and is driving further research into infection prevention in ultrasound. Jocelyne along with her colleague Sue Westerway and collaborators Jon Hyett and Jacques Abramowicz have recently published the WFUMB global survey on Medical Ultrasound Disinfection and Hygiene practices revealed a gap in knowledge of basic infection prevention measures in ultrasound. Keep an eye out for future research results within the Emergency Dept. Due to a recent upgrade to myASUM some members may be prompted to reset their password. The new password will need to be 7 characters and include a numeric character. The 2019/20 Membership Renewals will be sent to members shortly, now is a good time to check that your details are up to date to ensure you receive the membership early bird discount. A reminder that the ASAR Annual General Meeting is being held this Saturday the 13 April 2019 at 1pm. The meeting to be held at the Amora Hotel, Jamison Street, Sydney. Please login to the ASAR website for more details. Plan your CPD in advance, see our events webpage for further details and secure your spot today! The World Federation for Ultrasound in Medicine and Biology (WFUMB) and the Australasian Society for Ultrasound in Medicine (ASUM) invite you to the Melbourne Convention and Exhibition Centre for the 17th World Federation for Ultrasound in Medicine and Biology Congress. Looking for a previous version of RealTime News? All RealTime News and other ASUM news is available on our website. Interested in volunteering for your society? Complete an Expression of Interest form today! Find the person or role that's right for you! Login to myASUM to personalise your membership. The Australian Institute of Ultrasound and Martinoli Ultrasound Courses are teaming up to provide the most advanced and comprehensive MSK Courses available this May 2019. Prof Carlo Martinoli, Associate Professor of Radiology, University of Genova, Italy, is the author of a preeminent – text book on Musculoskeletal Ultrasound. Having devoted more than 20 years to musculoskeletal radiology education, he has held over 800 lectures globally and published more than 200 articles.